If the primacy of presence can be questioned, then the tradition of univocal metaphysics can be reevaluated by way of Jacques Derrida’s ‘deconstructive’ philosophy. The artwork Untitled (Corpus Vile) made in 2012, by the contemporary American artist Jason Loebs, offers a modest five-piece suite featuring margins. The marginal falls outside of the center of focus. The slim concept of marginalia presents a way of doing philosophy from the periphery. The marginal offers a generous place to explore Derrida’s deconstructive handling of traditional ways of seeing, thinking, or writing philosophically. Given that presence itself is questioned in Derrida’s deconstructive context, it will then be evaluated by means of Loebs’s piece as presented in a gallery, online, in print, etc. Deconstruction need not be characterized as a bygone trend/fad/fashion—instead it has to be handled carefully and without haste. In order to get at Derrida’s encounter with philosophy one must begin from the primary vantage of what deconstruction actually means by way of his technical terms: aporia and difference. These and a number of surrounding issues will be examined for this research paper. For the sake of organizational clarity this essay will be divided into two sections: in the first section “Reconstructing Deconstruction: an Impossibility” Derrida’s philosophy will be looked at, trying, at best, to define what Derrida meant by the now over-abused term deconstruction. To open the ideas up, the author of The Derrida Dictionary, Simon Morgan Wortham writes that for Derrida “deconstruction entails ‘the experience of the impossible.’” The humility of such an enterprise (i.e. impossibly defining deconstruction) will then have to be embraced in the noble spirit of brevity and necessary concision, while keeping in mind that deconstruction self-consciously defers definition. 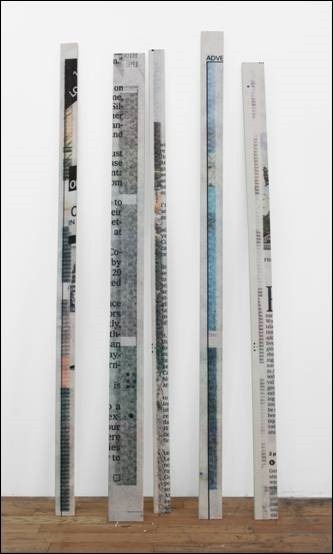 The second half of the paper, titled “Loebs’s Marginalia: a Deconstructive Reading” will feature another creative venture: to positively and deconstructively read Jason Loebs’s 2012 five piece artwork Untitled (Corpus Vile). Today there is a widespread belief that the philosophy of deconstruction entails taking things apart. In its most rudimentary sense the literal word deconstruction does actually mean to disassemble. But, therein lays a question as to whether or not deconstruction, that branch of late 20th century philosophy (with postmodernism and post-structuralism as its notable peers and influences) coined by Jacques Derrida, is entirely concerned with disassembly, destruction, and breaking things down? To be absolutely fair, its meaning must include this popular view to some extent, yet it must retain and go beyond it to be realized in a positive arena of writing philosophically. From its inception sometime in the late 1960s, deconstruction was primarily concerned with text, literature, philosophy, and writing in general. Deconstructive ideas can be (and have been) generously extended to other areas, such as architecture, art, ethics, and so on. Admittedly, there will be obvious problems discussing Derrida’s in/famous philosophy of deconstruction. Given these (soon to be outlined) problems, what is generally indicated by the term: deconstruction? Dermot Moran, in his Introduction to Phenomenology tells us that deconstruction is not a method, nor is it a “procedure or system of thinking.” And Wortham, admits to such problems when it comes to ‘grounding’ a theory of deconstruction “that which founds or institutes always imposes itself, for Derrida, more or less violently, more or less unjustifiably, taking possession of its ground at the price of significant exclusions or contradictions.” This means that while attempting to ‘define’ and/or ‘ground’ a deconstructive theory, it is almost counterproductive to the deconstructive process, since Derrida’s deconstruction aims to uncover what was excluded, or contradicted, in the original grounding, in the original foundation of a given text, artwork, etc.. All this begs the question again: then how is deconstruction defined, without appealing to a ground or foundation? This could be possible, yet an anxious appeal will have to be made with respect to more traditional methods of getting to know something, at least to initially describe it. In short, the philosophy of deconstruction will not be deconstructed here. There is an ambiguous term that reaches back to the ancient Greek philosophy known as aporia. An aporia is thought of as a riddle to be solved, or an aporia represents something that remains unresolved, or even, an aporia is a path. Derrida once asked “What would be a path without aporia?” Derrida made deliberate use of this ancient word in his deconstructive philosophy. As a matter of fact, aporia could be seen as way to introduce deconstruction. But there too is a conundrum with coming to any kind of solid conclusion about the meaning of the word aporia, as if there could be a conclusion about deconstruction itself, since an aporia can be thought of as an impasse, that which is unresolved, something un-decidable, etc. If a riddle is there to be looked at, it must be admitted that it must remain a riddle in order for it to be contemplated. This is to say that Derrida doesn’t seem to be working on ‘solving’ riddles. Deconstruction is not a method toward clear-cut solutions. It is better to think of deconstruction as opening up and showing the riddles to begin with, i.e. the activity of deconstruction is an avid disclosing of the riddles that are already there in the context of whatever writing, artwork text is under consideration. Deconstruction is already at work in any given text, philosophy, or artwork. Moran reminds us that Derrida consistently said that deconstruction “is an anonymous process which is already at work in the world, prior to our conceptualizations, as the very transcendental source of our conceptuality.” This must mean that the problems, riddles, oppositions that are looked at in deconstruction, are already there in the very way we logically think about things—the problems are there to be uncovered and examined. In the first paragraph for the entry “Deconstruction” from the Routledge Encyclopedia of Philosophy states that “what is typically occurs in a deconstructive reading is that the text in question is shown to harbor contradictory logics which are standardly ignored—or concealed from view—on other more orthodox accounts.” This idea of something that is ‘concealed from view’ is an aporia, which is considered to be the beginning of a deconstructive reading. A difficulty that immediately arises when trying to comprehend deconstruction is the aforementioned issue of oppositions. The ways binary oppositions are looked upon deconstructively is that they are themselves an aporia. Opposition creates a kind of challenge, or riddle to be disclosed for what it is. So this partially reveals what is meant when a text is deconstructed. As mentioned earlier, it is a misnomer to think of deconstruction as merely taking something apart, but, it was admitted that deconstruction still must contain this rudimentary way of thinking about it. Moran writes about this “Deconstruction involves taking apart the text to show that its supposed argument or thesis actually turns against itself…” Moran also ties this peculiarity in with G.W. F. Hegel “this is an essentially Hegelian insight which Derrida interprets in a new way.” Without getting too in-depth, Moran is suggesting that, as it is well known, Derrida read plenty of Hegel, and that at the core of Hegel’s philosophy is the dialectic, whereby the resolution to a contradiction must contain the contradiction within it. Derrida sought to question traditional metaphysics and deconstructive philosophy was how that was done. Derrida’s aim is not to ‘reverse’ these hierarchical oppositions—as it would be if he were interested in privileging writing over speech—but to deconstruct the very logic of such exclusionary founding gestures. This particular (and dare we say dialectical) way in which Derrida contends with the issue of binary opposition points to several key gestures in the philosophy of deconstruction—finding the aporia, exposing and disclosing opposition, working with thought and language without prioritizing either. First, différance refers to the (active and passive) movement that consists in deferring by means of delay, delegation, reprieve, referral, detour, postponement, reserving. […] Second, the movement of différance, as that which produces different things, that which differentiates, is the common root of all oppositional concepts that mark our language […]. This différance points back to what has been at issue all along: deconstruction. Because if différance combines the words deferral and differentiation, then what is left of meaning? Perhaps something that looks like this: “↔” deconstruction is an expression of always deferring and differentiating. One motive of deconstruction is detecting the aporia of opposition, then looking at what is not being said, along with what has been overlooked, by way of emphasizing what has been prioritized and expressed, then seeing what can be positively found ‘already at work’ deep inside the opposition, the conflict, the negation, the problem, the text, the artwork and, surely, the philosophy. Like phenomenology (Derrida ‘cut his teeth’ on Edmund Husserl’s early book Origin of Geometry) deconstruction is a descriptive understanding, an opening up, and a disclosure. §1. Grounding? …now to a question of grounding Jason Loebs’s 2012 artwork Untitled (Corpus Vile). Here is the usual tactic: what is his biography?—Where did he grow up? Where was he educated? Where does he live today? We already know that he’s American, but to what end will the question of where he was born serve? That he grew up in a culture that venerates mass media is already clear. That he is alive in the 21st century tell us that he is probably saturated in the ways of social media, and, of course print media, etc. These things are assumptions since there is no real way to ask him right now via e-mail, or otherwise. So, the things that we can tell about him, without direct knowledge of his biography will remain mostly presumptive. The fact that he’s American doesn’t suggest very much, other than the obvious. However, a quick glance at his CV from his Gallery Essex Street, in New York, NY does tell us some specific things about him. Loebs was born in 1980, in Hillside, New Jersey. In 2011 he went to the Whitney Museum of American Art, on an Independent Study Program, in New York, NY. In 2007 he received his MFA from the Art Institute of Chicago, in Chicago, IL. In 2004 he received a ‘certificate’ from the Pennsylvania Academy of the Fine Arts, Philadelphia, PA. And in 2003 he attended Yale Norfolk, in Norfolk, CT. Okay, there’s more of what might be called a traditional grounding. This does inform a little more than if we only knew that he’s an American. And now that we know he’s from the East Coast, perhaps he was born into a family of privilege, if he didn’t come from money, then he still had to work really hard to get where he’s at. If he was born to money, he had to work hard, if was born poor, he had to work hard. Both scenarios imply work. It can’t be assumed it was easy for him to get where he’s at, living in New York, NY, one of the most expensive places to live on the planet. As it can be tediously seen, we are getting to know Loebs better, but are we getting to know his art any better? We could draw multiple conclusions from his past, say, if we knew about his hometown in New Jersey, or if we knew he various professors in Chicago, New York, and Norfolk—but we don’t. So his biography has revealed that he’s an American, he’s probably from a well-off family, he has a solid (okay, elite) education, and that he is actively showing his work in a hip New York gallery. We would have to know more about him to give this ‘grounding’ any more weight then a cursory glance at his CV provided by him and his gallery. To be sure, anytime he wishes to show anywhere else, these spare details will be the first things people look at, other than his art, of course. Odd that so much of his life’s effort is reduced to just a few lines on a CV, a few lines of text. But, one shouldn’t be dismayed at such a reductive look at his life. After all, he’s getting our full attention right now. The slim facts of his biography have already informed us about things that go far beyond dates and places. He’s somewhat successful, he’s made a name for himself, and that he’s a represented artist. Here it can be seen that a typical maneuver of art historical research, that is, to look into the biographical details of an artist to inform us of his/her work, (and with all due respect to Loebs) was oddly not very productive in telling us about his artwork. The biographical grounding becomes something that’s not really informative beyond his professional CV. Still it was very productive in showing how, in some cases, little of a person’s biography can actually tell us about his/her art. §2. Aporia. Loebs’s artwork Untitled (Corpus Vile) is something to be disclosed. But what is to be disclosed is a group of five room-height (8’ 9” tall) margins that look to be from the edges of a newspaper. When looked at closely, they are not just the edges of the newspapers cut off, then photographed. They look like they have been photo-shopped and reworked. The edges of the text have been cut off. If these were ordinary margins from newspapers, the words would not be cut off on the margin side on the edges of the page. There is the mystery of why he didn’t use the only the bare edges of newspapers. Why did they have to be photo-shopped? It is questions like this that point to another question: why are we always trying to get at the source of the artist’s reasons why he/she did something in the first place. It is as if what is there in front of us is not answer enough. Then this leads to another important issue about how we are viewing the work. It is not in the gallery pictured here on this pixilated computer screen (or on the printed page). It is often thought that seeing an artwork up close and personal, i.e. live, is better that in reproduction. But a reproduction is all we have right now, this is it, this artwork will probably never be seen by us in person. Is this somehow a lesser experience? And how much artwork do we look at only in reproduction? The deconstructive problem of presence becomes an important one in this case. Loebs himself might think of how his work looks online, and the gallery too must have thought of it too, since they’re offering it to be seen on their website. How often are we aware of such seemingly unimportant ways that we view art? The presence of the Untitled (Corpus Vile) is virtual, but is this virtual way of seeing it less than a real way of engaging the work in person? §3. Already at Work. The curious ‘non-title’ of Loebs’s artwork: Untitled (Corpus Vile) is one way that deconstruction is already at work in the work. First, it is not titled, yet behind the fact that it is not titled it has a parenthetical title: (Corpus Vile). Corpus, meaning body, or body of work, a collection of work, in this case Corpus must mean a collection of works, a suite of margins that are themselves a small body of work. There might also be a suggestion of a body. The artwork consists of five pieces, suggesting a head, two arms, and two legs. And then there’s Vile, meaning disgusting, evil, etc. Putting the parenthetical part of the artwork’s title together, we have a disgusting body that hides behind no title. Yet, there is not all that much that is visually disgusting about the piece. This title must serve as an allusion to the disgust we have with the marginal. That which has no primary focus is something to be ignored or reviled. Indeed we dislike those things which are marginal, because we want what is important, what is relevant. Newspapers themselves are now marginal media, and when there is the emphasis on the marginal of the already marginal, surely there is deconstruction at work, waiting to be disclosed and opened up. The marginal is the subject matter, and that which is disgusting is not as acceptable as getting to what’s important—the ads, the stories, and the journalism. Heraclitus, “Fragment 83,” Fragments: The Collected Wisdom of Heraclitus, translated by Brooks Haxton (New York, NY: Viking Penguin, 2001), 52. Simon Morgan Wortham, The Derrida Dictionary, (New York, NY: Continuum Books, 2010) , 1. That Wortham places ‘experience of the impossible’ in singular quotes, it is likely that this is a quote (or paraphrase) from one of Derrida’s seventy+ books, but it is not indicted which one. By stating that this will be a positive reading means that Loebs’s artwork will be looked at (read) with an understanding that deconstruction is not an outright destructive process, and that the philosophy is better situated and grasped as a positive descriptive engagement, i.e. it is less a question of what the artwork is not, and instead what can be said about the artwork—deconstructively. The Belgian/American literary critic Paul de Man (1919-1983) is considered to be another leading proponent of deconstruction. Dermot Moran, “Jacques Derrida: From Phenomenology to Deconstruction,” in Introduction to Phenomenology, (New York, NY: Routledge, 2000), 450. Wortham, The Derrida Dictionary, 1. Namely with Plato’s dialogues Meno, Euthyphro, etc. Jacques Derrida, On the Name (Meridian: Crossing Aesthetics Series), translated by David Wood, John P. Leavey Jr., and Ian McLeod (Stanford, CA: Stanford University Press, 1995), 83. See Wortham’s entry for “aporia” in The Derrida Dictionary, 14-16. Moran also names “logocentricism” as another target of Derrida’s deconstruction, but it is bypassed here in the practical interest of brevity. Christopher Norris, “Deconstruction,” in Routledge Encyclopedia of Philosophy, 835-839. Andrew Cutrofello, “Jacques Derrida,” in Routledge Encyclopedia of Philosophy, Brahman to Derrida, Volume 2, edited by Edward Craig, (New York, NY: Routledge, 1998), 896-901. Andrew Cutrofello, “Jacques Derrida,” Routledge Encyclopedia of Philosophy, 898. Jacques Derrida, “Implications: Interview with Henri Ronse,” in Positions, translated by Alan Bass. (Chicago, IL: The University of Chicago Press, 1981), 1-14. Note, this book also contains a fascinating interview with Julia Kristeva. See Wortham’s entry “Edmund Husserl” in The Derrida Dictionary, 73. In 1962 Derrida wrote the introduction to Husserl’s Origin of Geometry (1936?) and he wrote a dissertation on The Problem of Genesis in Husserl’s Philosophy. Also recall Derrida’s indebtedness to Husserl’s in/famous student Martin Heidegger. Heidegger often spoke of truth as aletheia, a disclosure, etc. Also note: Derrida’s term deconstruction is derived from Heidegger’s destrucktion, which featured in Heidegger’s 1927 lecture course The Basic Problems of Phenomenology. Moran, “Derrida,” Introduction to Phenomenology, 451. Jacques Derrida, Of Grammatology, translated by Gayyatri Chakravorty Spivak (Baltimore, MD: The Johns Hopkins University Press, 1976), 200. Bennington, Geoffrey and Jacques Derrida. Jacques Derrida. Chicago, IL: The Chicago University Press, 1993. Derrida, Jacques. Of Grammatology. Translated by Gayyatri Chakravorty Spivak. Baltimore, MD: The Johns Hopkins University Press, 1976. —. On the Name (Meridian: Crossing Aesthetics Series). Translated by David Wood, John P. Leavey Jr., and Ian McLeod. Stanford, CA: Stanford University Press, 1995. —. The Truth in Painting. Translated by Geoffrey Bennington and Ian McLeod. Chicago, IL: The University of Chicago Press, 1987. —. Who’s Afraid of Philosophy? Right to Philosophy 1. Translated by Jan Plug. Stanford, CA: Stanford University Press, 2002. Heraclitus. “Fragment 83,” Fragments: The Collected Wisdom of Heraclitus. Translated by Brooks Haxton, 83. New York, NY: Viking Penguin, 2001. Mikics, David. Who Was Jacques Derrida? An Intellectual Biography. New Haven, CT: Yale University Press, 2009. Moran, Dermot. “Jacques Derrida: From Phenomenology to Deconstruction.” In Introduction to Phenomenology, 435-474. New York, NY: Routledge, 2000. Norris, Christopher. “Deconstruction.” In Routledge Encyclopedia of Philosophy, Brahman to Derrida, Volume 2, edited by Edward Craig, 835-839. New York, NY: Routledge, 1998. Wortham, Simon Morgan. The Derrida Dictionary. New York, NY: Continuum International Publishing Group, 2010.